Well, I'm back in the US. I got back on the 24th and then went camping. I'll add a few more posts about my trip to Peru in the next few days or weeks -as I get over a cold-, before sending this blog into it's customary winter dormancy. Tonight I joined thousands of others downtown in a protest against the recent actions of the Peruvian Congress. On the 18th, the nation watched via a live TV feed as the four parties with the largest share of representatives in Congress, which included the party of former president and dictator, Alberto Fujimori (who is serving prison time for graft, corruption, and human rights abuses), and that of the current president, Ollanta Humala- consumated a political deal between them to get their members elected to head the Central Reserve Bank, the Constitutional Court, and the Public Defender's Office. The four parties -Gana Perú, Fuerza Popular, Perú Posible, and Alianza Por el Gran Cambio- pushed through a vote for the candidates in a block, instead of on a one-by-one basis, as required by the Congressional regulations in place since 1975. As a result, the candidates were selected based, not on personal and professional qualifications, but on quotas set in backroom partisan wheeling and dealing. In fact when one Congresswoman tried to abstain, she was browbeaten into voting in favor, on the grounds that she "had to agree" as her party had a "political agreement" to which she was supposedly bound. To make things worse -with the exception of those elected to the Central Reserve Bank- the elected were perhaps among the worst candidates, lacking in relevant experience, having conflicts of interest, and having been connected to or defended human rights abuses and corrupt practices. The people's rejection was immediate and loud. Almost every newspaper, magazine, newsprogram, NGO, labor union, political movement, student group, and others spoke out against the repartija - the divvying up- in Congress. That very night there were spontaneous protests in Lima. There was another demo called for tonight as a show of rejection and a means of pressuring those elected into stepping aside, and Congress into approving an extraordinary session for Wednesday to anul the election and hold another, clean one. Well, I'm down to my last two days here. In about a half hour I'll be off downtown, to a demo at the Plaza San Martin in protest against a bad vote in Congress which resulted in some very questionable appointments to high legal offices, and in support of a motion to annul that vote and hold a new one which will elect the candidates on an individual basis -not in a group- and based on individual merit -not on backroom political deals. I've started packing this morning, then went to lunch with Willy and Elba at Puro Peru, and then a quick shopping stop in Polvos Azules, before coming home for a rest before heading downtown. On Friday Willy took me to lunch at one of Pueblo Libre district's old-school haunts, the El Bolivariano restaurant. El Bolivariano ranks as another of Lima's "classic" eateries and is many people's favourite place for classic criollo cuisine - which makes it all the more surprising that I had never been there despite hearing and reading about the place for so long! The ambiance, is of course, old-school limeño, the place being located in an old house, and filled with antiques and old photographs. The service was curteous, attentive, friendly, and very smooth. That comes, of course, from it being provided by older, professional wait staff, and not just a bunch of kids trying to get by or doing it only because it's the family's place. The food, was very good. I would say that one would be hard pressed to find a place with better or as good versions of them, but that would only be true anywhere but in this city. In any case, these were comfort food done right -the tomatoes in my fish dish were peeled and seeded!- and who can ask for more from an old-school restaurant? I'm very glad I finally went there. We had a birthday get-together for me the other night on Willy's terrace. Willy and I went shopping that morning in the Jesus Maria market for meats and other items. We supplemented those with some cheeses that I had brought from the US for the occasion. Most of the cousins and aunts and uncles were able to attend, and we had a really nice time. I tried to take pictures, but mostly the lighting was poor so only a few turned out, and those were of things that happened to be essentially immobile at the that instant! Yesterday afternoon I headed toward downtown, to the Lima Museum of Art (Museo de Arte de Lima, MALI). The MALI is located at one end of the Parque de la Exposición, at the intersection of Paseo Colón and Ave. Garcilazo de la Vega (everybody still calls it Wilson, its former name), about a block down from the former US Embassy and the Casa Matusita. The "Byzantine Pavillion". In the background, at right, the "Moorish Pavillion". The Parque de la Exposición was built for the 1872 Lima International Exposition, and the MALI occupies the main building, the former Palacio de la Exposición (Exposition Palace). The building itself was restored in the late 1950s to house the museum, which opened its doors to the public in 1961. The MALI houses examples of 3000 years worth of Peruvian and other artistic creations. It also offers art classes and courses in art history, and has a library that is open to the public. My purpose for going, however, was to view the current exhibit of works by Peruvian indigenist painter José Sabogal. Sabogal was one of the first, if not the first, artist of note to directly and explicitly incorporate Andean and indigenous imagery and persons as central subjects in art. At L, "Varayoc de Chinchero" (1925); at R, "Mujer del varayoc" (1926). Sabogal thus played a key role in Peruvian art and in Peruvian social history, at a time when the idea of Peruvian nationhood was being redefined as result of the disastrous war with Chile, immigration, and other pressures. There was a search for an "essential Peruvianness", based less on geographical accident than on culture and history. Sabogal made a study of traditional pyrography and etchings on dried gourds, an traditional craft that is practiced throughout the country, and published several articles on the subject, and was inspired by it in his own etchings and other designs. He played a foundational role in the development of Peru's indigenistas. 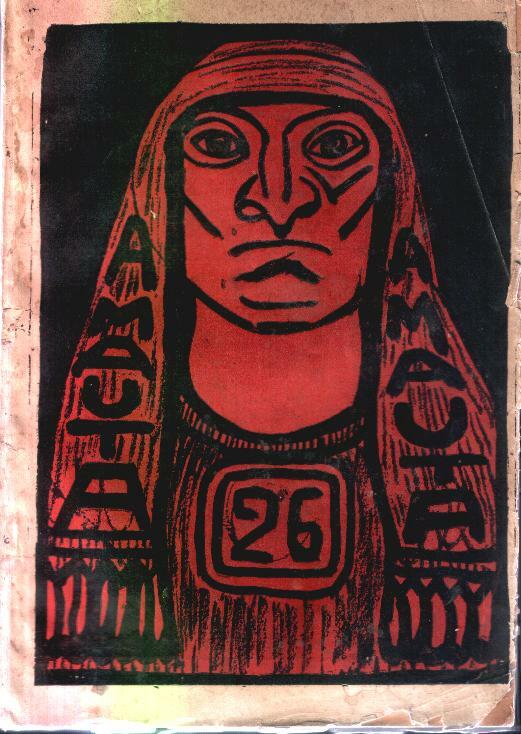 For example -and this was a revelation to me- it was Sabogal who suggested the name of Amauta, the seminal political and literay magazine founded by José Carlos Mariátegui, and it was Sabogal who developed its logos and interior artwork, as well as a number of the cover designs. Sabogal influenced a generation of Peruvian painters who could be called the indigenista school. Camilo Blas (1903-1985), just to give one example. Last year I attended the opening of a show of paintings and drawings by Camilo Blas , who was the grandfather of my friend Carla, and was a friend and disciple of Sabogal's. Blas' work made an impression, and from the MALI showing the influence that Sabogal had on Blas's work was clear. In fact, my initial interest in the Sabogal show was that I confused Sabogal's work with Blas' when reading an article in a magazine about the opening of the exhibit!